D and I have been away for a few days. We went to Stratford to see Twelfth Night at The Courtyard Theatre. 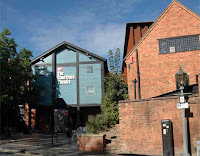 Although we have stayed in Stratford several times over the last 10 years and watched several plays performed by the Royal Shakespeare Company we had never been to The Courtyard Theatre before. We were quite surprised that it was some distance away from the main theatre and in what looks like a large rusty metal box. Fortunately the inside is nothing like the outside and the auditorium is impressive, seating over 1,000 people, with the audience seated around three sides of the stage. We were in the stalls and had a really good view of all the action on the stage. On previous visits to Stratford it has been crowded with tourists and we’ve never visited Shakespeare’s birthplace. 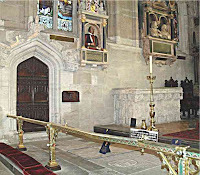 We didn’t make it this time either, but when we walked up to The Courtyard theatre in the morning before the matinee we followed the signs to Holy Trinity Church where Shakespeare was baptised in 1564, where he worshipped and where he is buried. Holy Trinity Church is a beautiful church dating back to the 13th century, set in a lovely, peaceful position by the River Avon. Perhaps next time we’ll manage to visit Shakespeare’s Birthplace and the Shakespeare Centre. We stayed at the Alveston Manor Hotel. We’ve stayed here before, as it is just a few minutes walk from the River Avon and the RSC Theatre and also because the original timber-framed house is a beautiful Tudor building, full of atmosphere – leaded Elizabethan windows, panelled walls lined with paintings of Shakespeare and characters from the plays and photographs of old playbills. It is set in gardens with an ancient Cedar Tree under which, it is rumoured, the first performance of ‘A Midsummer Night’s Dream’ was given. At the end of the performance we overheard a conversation from a couple following behind us as we walked away from the theatre: ‘I thought Feste and Malvolio were the best.’ ‘Oh no’ came the friend’s reply ‘I didnt like Feste at all – ‘far too modern and the microphone! Her friend: ‘I didnt like Sir Toby, a woman doesn’t have enough stature to play a man.’ The cross-dressing was not to everyone’s liking, although I think the teenage element of the audience found it hilarious. This was the second performance of Twelfth Night that we’ve seen by the Royal Shakespeare Company in Stratford. The first time was in the RSC theatre, now closed because a new auditorium is being built (due to be completed in 2010). That was a traditional performance, complete with Feste, the fool dressed in motley, playing a lute, an Elizabethan set and was very colourful and funny. This performance was different. The setting was black; nearly all the actors were dressed in black Edwardian costumes and not a box-tree in sight. Feste was a dissolute musician in evening dress, playing a grand piano, and using a microphone into which he drawled at the opening of the play ‘Twelfth Night – or What you Will ‘ – and the scene was set. On came Viola, shipwrecked, barefoot and in a nightdress and shawl, and obviously a man. The play continued – Viola, believing her twin brother, Sebastian has drowned in the wreck ‘disguised’ as a boy, Cesario, goes to the court of the Count Orsino, who is besotted with unrequited love of the Lady Olivia, who repels his wooing as she is in mourning for her dead brother. Everything is topsy-turvy in this play and this performance certainly demonstrated that, with Sir Toby Belch (Olivia’s uncle), Sir Andrew Aguecheek (a foolish foppish knight) and Fabian (a servant) all played by women, giving a pantomime performance and reminding me somewhat of the hobbits in Lord of The Rings – small in size but yet full grown and different from adult men. I could suspend my disbelief to enjoy their performance, even though I found it a bit bizarre, but I’m sorry to say that I found the performance of Viola/Cesario (Chris New) was just not convincing – even though I know that originally women’s roles were played by boys, there was no way that I could conceive he was a woman disguised as a boy, nor that Olivia could possibly find such an effeminate young man attractive, let alone fall in love with him and this grated and irritated me throughout the play. I did like Feste (James Clyde); his foolery, his bored condescension and his singing were superb. I also liked Olivia (Justine Mitchell) and her housekeeper Maria (Siobhan Redmond) who both gave spirited and convincing performances. Malvolio (John Lithgow) was magnificent in his portrayal of the ridiculous steward driven into seeming madness, wearing cross-gartered yellow stockings and smiling grotesquely. The grand piano had to stand in for the box-tree, so that this was where the tipsy Sir Toby (Marjorie Yates in tweeds) and the others hid to watch Malvolio find the letter written to fool him into believing Olivia loves him and it worked quite well, as the actors popped up and down commenting on and sniggering at Malvolio’s conceit and self importance. Twelfth Night relies on the use of language and wit and is essentially a comedy about deception and disguise, about illusion and reality, about what is sane and what is rational and above all about love, the irrationality and unruliness of love. Like the lady behind me I thought Feste and Malvolio were the best and I’d add Maria and Olivia as well – they were all excellent and made the play one that I enjoyed and will remember. 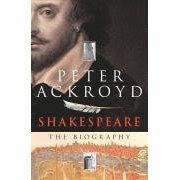 An added bonus was that whilst in Stratford I bought a hardback copy of Peter Ackroyd’s Shakespeare: the Biography for the bargain price of £3.35. 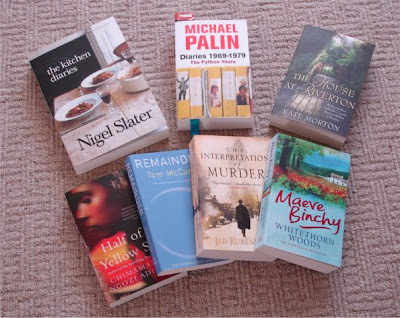 They make a mixed bunch, some I ‘ve read about on other blogs – nos.3, 5 & 6 which I thought would be good. Ever since Kimbofu admitted to reading Maeve Binchy I’ve wondered about Whitethorn Woods, hence this choice. Half a Yellow Sun won the Orange Prize for Fiction this year and is described on Amazon as “compelling”, “disturbing”, “fantastic”, “brilliant” and incredible”. Which brings me to the diaries of Nigel Slater and Michael Palin. (Diaries and auto/biographies seem to be currently featuring high up in my reading preferences.) Nigel Slater’s cookery programmes are very entertaining and his food always looks delicious. His book is autobiographical (I’d like to read his autobiography “Toast” sometime) as well as being a recipe book. The photos were taken in “real time”; Nigel writes “After I have cooked each meal and it has been photographed, we sit down and eat it while it is still hot. Then I wash up.” That’s what I like – it’s real stuff. I’ll certainly be trying out his recipes. And now for something completely different – via Michael Palin, a great entertainer and long-time favourite. I started to read this book as soon as I opened it and it had me laughing straight away with his description of how he gave up smoking and started to write a diary to keep his “newly liberated fingers occupied”. Of course, the enjoyment of this for me is not just the details of how Monty Python came into being, but also this is about life in the 1970s – the index shows the broad range covered from literature, films, theatre, TV and radio programmes through to the electricity power-cuts and the three-day week, politics and politicians, cricket, football, and a Yeti expedition; and not forgetting information about family, friends and colleagues. This should keep me quiet for a while. On second thoughts it won’t – as I’ll be reading bits of it out loud so D can enjoy it – he’s an even bigger Python fan than I am and he’s also started to read this. No doubt I’ll be treated to his versions of the Argument and the Dead Parrot sketches etc, etc. To round off my birthday D treated me to a sumptuous meal at Hartwell House. The House is beautiful, with both Jacobean and Georgian features. It has spacious rooms, with decorative ceilings and panelling, paintings and antique furniture. Its most famous resident was Louis XVIII, the exiled King of France who lived there from 1809 to 1814. Our meals were delicious, my pudding was outstanding – passionfruit souffle, with dark chocolate sauce and orange carpaccio and orange sorbet , undoubtedly the best pudding ever. Last weekend we visited Norton Park, a QHotel, near Winchester. Although we knew building work was being done at the hotel we were surprised to find it was essentially a building site. Our room was in this block, quite near the carpark, but a long way from reception and the restaurant. This block is the furthest away from the main part of the hotel, which is reached by walking round the rest of the unfinished areas. And reception, the bar and restaurant could only be reached by going down these steps – not for the faint hearted or the disabled. The good parts of our stay were that the room we had was good, even if the view was of yet more construction work; the food was good; the staff were friendly and welcoming – particularly Basia on reception; and the leisure facilities were also good – particularly the sauna. The old original manor house is still there, but this is also some distance from the restaurant and reception. If we go there again, I think we’d prefer to stay in this older part of the hotel and only go when it is all finished. Winchester is about 10 minutes drive away and is well worth a visit. More in the next post.